Launched in 2014, the Fellows Program is a year-long, multi-city experience that brings together a curated cohort of 24 executives from business, nonprofits, government, philanthropy, and academia. Participants learn from leading practitioners in multi-sector leadership, organizational development, and collaborative problem-solving. Fellows come to the program with real-life challenging projects they are facing and engage with colleagues and instructors, learning how to apply 21st century approaches to find solutions. 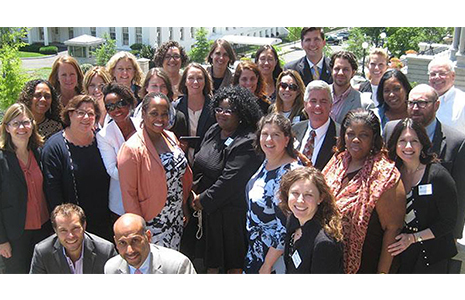 Fellows participate in a series of multi-day, in-person learning sessions throughout the year at Pepperdine campuses in Malibu and Washington, DC, as well as in New York, along with online education elements in between. Targeted at mid-career leaders, Fellows have access to senior-level leaders at the federal and local government level, Tesla, Blackrock, United Way, DC Central Kitchen, McKinsey & Co., and Google. Successfully completed, Fellows earn a Certificate in Cross Sector Leadership from the Pepperdine School of Public Policy. University News Academics Law & Policy Events Government & Politics Law & Policy Malibu Campus Students Washington, D.C.